Winter is approaching, and next stop is for Christmas. Lets celebrate it with some Christmas reading! Here is a comic strip I did some 30 years ago. "Jonas" is a character that I created in 1984. Inspired by the character "91:an" and other Swedish comics, "Jonas" is often driven by puns and slap sticks. A classmate was the model for the figure, although Jonas' personality is probably more like myself. The stories took place in a small town somewhere in Sweden, and some of the panels glimpses the environment from my childhood village Karlsborg. So - enjoy some 30 pages of eighties style comics, and have a Happy Christmas! PS: it’s all in swedish. This blog has been left astray for a long time now, but it is not quite dead yet! I've been busy working as teacher in school with a number of new studies, with the time consuming process of creating exercises for it. Here are some of my own work during the preparation and lessons! A forest scene in lead pencil. One of my new studies is Image and Form in which we have begun to test different techniques. 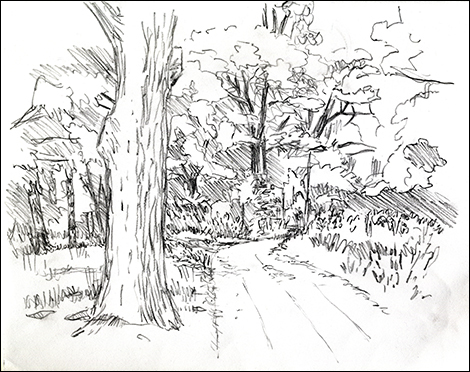 We started to go out into the nearby forest and made ​​detailed sketches of the landscape with lead pencil. The focus was on the motif by watching more of the landscape than the drawing. The next step was to revise the drawing with ink and to simplify the motif. 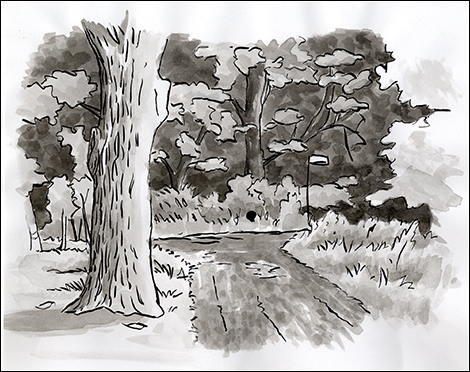 We used an old-fashioned type of ink pen for the line art, and brushes with water to the ink to create grayscale. The same motif in ink and water. Finally , we did a watercolor version in full color. We tested the wet-on-wet and dry brush to achieve different effects. The watercolor should have the feel of a fairly rapid implementation, so we made several versions of the same motif. While waiting for the previous image was dry, a new one was painted in the meantime. 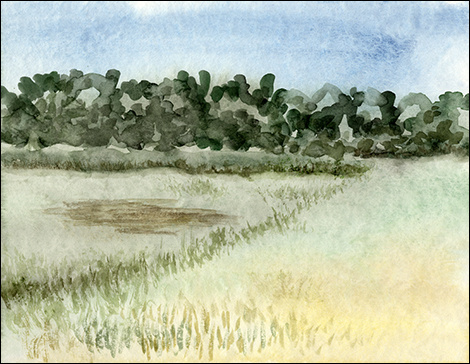 Water color version of one of the other landscapes. Now it's fall break, but I will not have that much free time. This week will be filled with illustrations for Jordbruksverket. So the chance is that there are more landscapes! 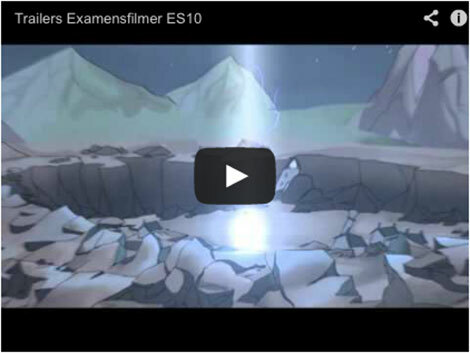 The trailers for the graduating students of ES10. So here we go again - this year's graduating students on of Arts program in Eksjö premiered their thesis films last Thursday. 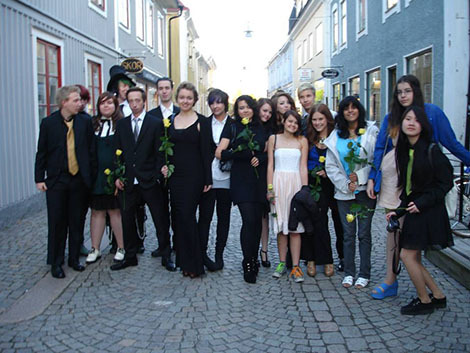 This years new event was the severance students at Sörängen Folkhögskola premiered their movies as well. Overall, it was a show of 22 short films in a total length of one hour and twenty minutes! Everyone was excited and aroused with positive opening jitters. These premieres has gotten higher and higher in expectations over the years, and the main characters are often dressed-up as for a real gala performance. The evening ended with dinner at one of Eksjö popular restaurants. 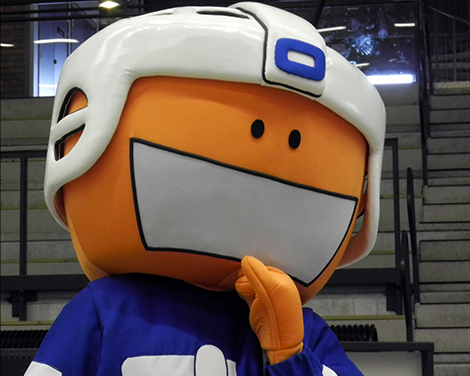 The space cartoon character that I have designed to Sparbanken Lidköpings Arena has come to a full life mascot! The cartoon character has been tailored up in some of his outfits as the arena opened their official website. The result has in my opinion been successful, even if he look a bit scary in full size. Two newspapers ( here and here ) has written about it. The figure is as yet untitled and will be baptized by a naming contest. Last year I made a new version of "Now or Never II - The King Mix", that was more uptempo than the original version from 2009. The song is exclusively made up of Elvis samples, to something I call the first new song the King has ever made since his death in 1977. I got the idea of ​​letting Elvis sing this song since a few years back as I was experimenting with different "speech engines". I did an English cover of Benny Andersson's "You are My Man" where I autotuned a synthetic voice. "Now or never II" was originally intended for myself doing the vocals, but my performance was too geeky. Who would I ask for help ...? 1. Locate audio tracks where Elvis sings the "right" words uncovered from accompaniment. 2. Digitally cut out the desired words from these various soundtracks. 3. Auto Tune each word so that he sings it in the right pitch and timing. Amadeus II is a great and easy-to-use for noise reduction. 1. In order to work with Elvis' voice I needed to find songs where his vocals were layer bare. After much surfing, I found a site for dj's that make custom mixes and mashps (http://www.acapellas4u.co.uk/download_list.php). There were a handful of Elvis songs with his voice exposed. These "acapella versions" were utilized to the maximum, but I needed more material to work with to find the words I needed - preferably with the right attitude in his voice, when my melody spans a register from subdued to maximum in intensity. 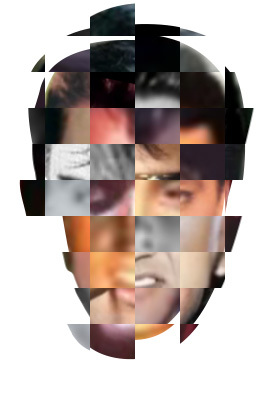 I also combed out Youtube of suitable Elvis songs that I recorded digitally. In many of the '50s songs, the verses are like a duel between Elvis and the orchestra. First, some tough guitar chords, then Elvis responds (as in Jailhouse Rock and Heartbreak Hotel for example). These songs has of course been the subject of my interest. But the most coveted vocal efforts were often not available on any of the above types of soundtracks. Where Elvis was at his best, background accompaniment was necessary to filter out: noice reduction, high-pass and low-pass filter was used with varying success. 2. The next thing to do was to cut out word by word in the audio editing software Amadeus II. Over time, it became a rather large library of Elvis words - if you want 35 versions of when Elvis sings 'life' - call me! Melodyne is the opposite of a karaoke machine. 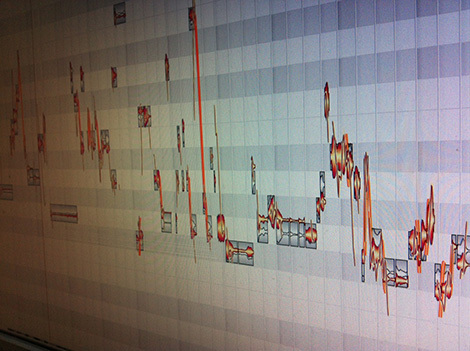 No matter how out of tune you are - in Melodyne it’s possible to correct each and every word in pitch. 3. 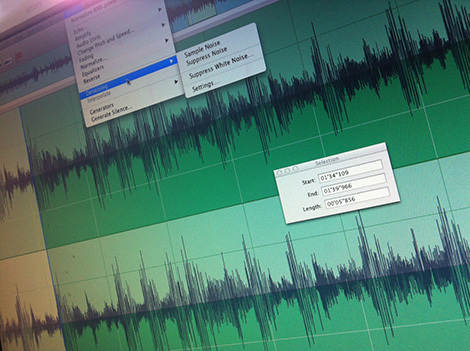 Time to put the audio into the autotuning software Melodyne. Here I could pitch and stretch Elvis' voice so it would fit my tune. There were several pitfalls of falling into in this stage: it could be too much noise left in the background that could even ruin Elvis 'voice, and steered the voice to hard would drop Elvis' special voice out of character and make it unclear. I allowed myself however retain some Cheer-effect in some places, partly by necessity, partly because I saw a point in revealing "the trick". 4. The various elements were then put together in the sequenser GarageBand with accompaniment. To keep it as clean as possible, I have avoided adding some extra effects. It is thus only original sounds own echo and reverb effects that you hear. All in all, it took me one and a half year to produce the song, with another two and a half year making the video! You may wonder if it's ok to use copyrighted material this way. There are no sounds on the whole song that is not owned by a record company. On the other hand, much of audio is so distorted from the original that it is difficult to deduce it from a specific recording. The other night I asked the King Himself what he thought in question, and he replied: "real rock n 'roll has always been on the wrong side of law. So, if it’s up to me, you can do anything as long you lay off of my blue suede shoes”. 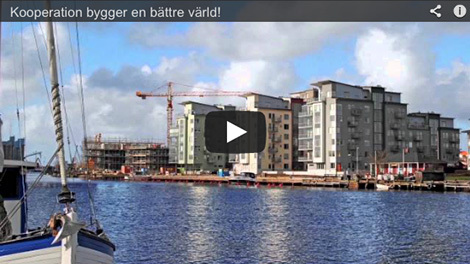 Take a look at my latest comic strip for Sparbanken Arena in Lidköping. In this new episode, their spaceman moniker tries his luck on the slippery ice with skates on his feet. Stollerier 2005 - 2012 is published and unpublished comic strips by me and Danilo Giannini. Click and read! My comic strip page has been pretty messy since I started it a couple years ago. The pages were all over the place and in the wrong order. Now I have found a page for online publishing that I stumbled across as I worked with Coompanion (see previous post). At the site http://issuu.com/bonordin it’s possible to upload your creations and publish them in a more coherent structure. It's much easier to choose among titles and turning the pages is almost like the real thing, and it’s all free! So if you have a unreleased master piece in the drawer that publishers do not have the eyes to see potential in - issuu is the site for you! Me and my brother in arms Björn Skallström has worked with a commercial for a coffee table book recently. The book is called Kooperativ bygger en bättre värld and shows different forms of co-operatives around the world. Our client wanted the images from the book to look like moving pictures, so we did a kind of digital 3D moves in the 2D pictures, and sometimes moving objects within the picture. To show that the images came from the book, we also added stop-motion animation of the book when the pages flipped.